Gottschalk was born in Herford, Westphalia, Germany in 1834, the son of Levi and Lina Gottschalk. When he was only three, his father died, leaving his widowed mother with three small boys to raise. One of Albert’s younger brothers, Noah, soon would follow their father in death. 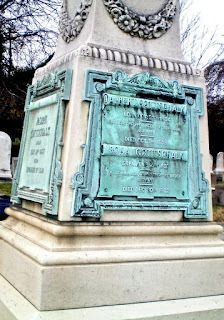 Gottschalk received the quality German education available and early went to work to help support the family.Reaching twenty-one, perhaps to avoid being conscripted into German military service, he immigrated to the United States, settling in Baltimore. 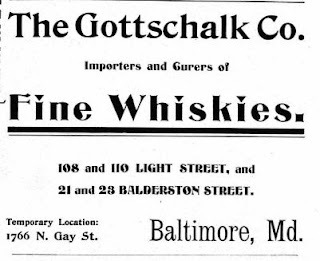 While details of his early life in America are sketchy, Gottschalk appears to have had experience working as an employee in one of the many wholesale liquor houses in Baltimore. In that city he also met Rosa Ullman, an immigrant from Baden, Germany. They married about 1859. Albert was 25, his bride 22. They would go on to have a family of four children, two boys and two girls. By at least 1867, Albert had graduated from working for a liquor dealer to being a full partner in a company called Gottschalk & Spilman, located at 46-48 Light Street, the avenue shown above. Over the next decade the company prospered as liquor distributors and “rectifiers,” that is, blenders of whiskeys obtained by other sources. The company bottled the liquid in glass bottles or ceramic jugs and sold them under proprietary labels. 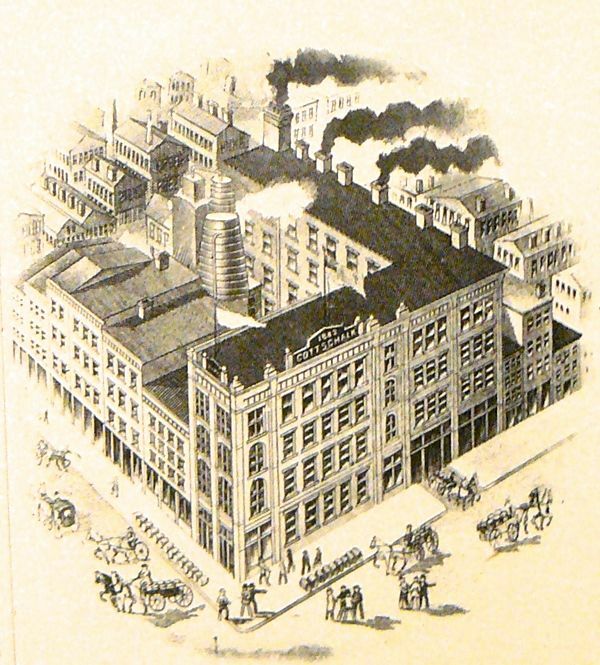 By 1887 Spilman was no longer in the picture and the firm now was Gottschalk & Company (later to become “The Gottschalk Company”). In the same year the now sole proprietor moved his operations to larger quarters as 108-118 Light Street and several years later opened a second outlet at 21-23 Balderston Street. Indicating the national attention its Maryland rye was attracting, it opened an office in Chicago to spur Midwest sales. 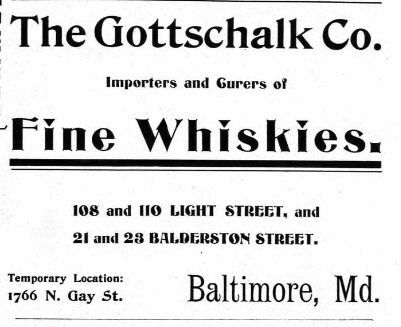 The Gottschalk organization featured a range of whiskey brands. They included "A. A. A.,” "Bluebird Rye,” “Bortner,” “Buckwater,” “Dictator,” "Family Nectar,” "Oliver's O. K.,” “Pointer Rye," "Social Session," ”Sunny South,” and "Virginia Club.”Of these, the company trademarked only Bluebird Rye and Pointer Rye in 1906 and Dictator, Sunny South and Virginia Club in 1914. 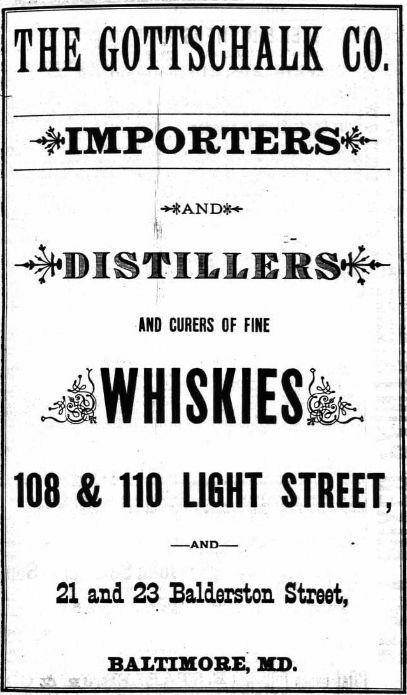 Much of this whiskey was sold in flask sized glass bottles embossed with the company name. 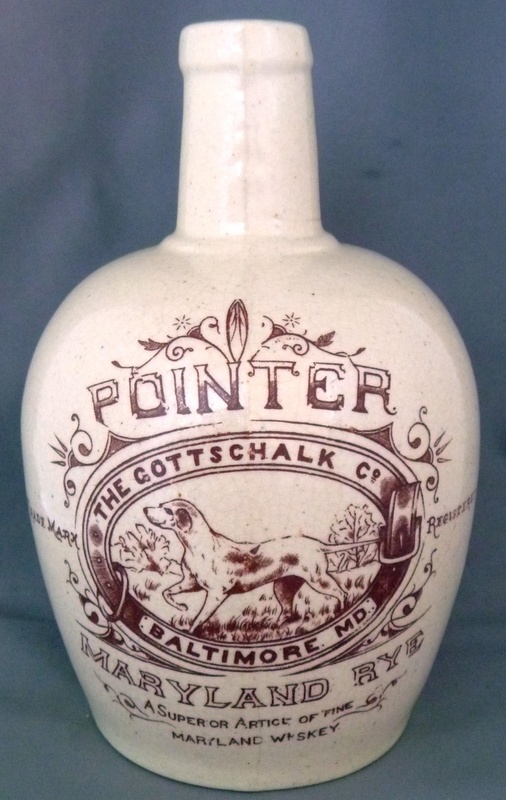 Pointer Rye became Gottschalk’s flagship brand. Advertised as “A Superior Article” and “THE Maryland Rye” the firm gave it a distinct quart jug to emphasize its quality. Jim Bready noted: “Pointer Maryland Rye…was the only Baltimore whiskey marketed in an expensive, glazed, transfer-decorated pottery jug.” As shown here, those ceramics came in several transfer colors including black and red, and body colors of sepia and off-white. 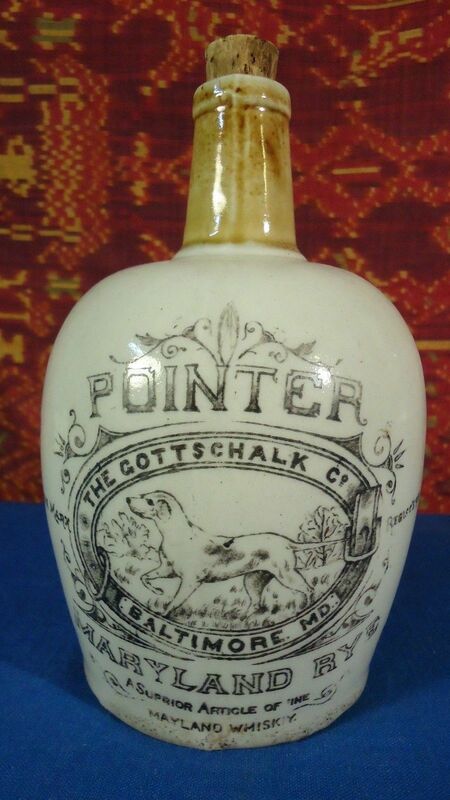 Characterized by the illustration of a hunting dog “on point” the jugs are avidly sought by collectors in Maryland and elsewhere, and as a result good specimens are pricey. Along the line, Albert brought his son Joseph Gottschalk into the business with him, initially as a clerk but eventually in management as company treasurer. In the late 1890s the Gottschalk’s bought the Standard Brewery of Baltimore, an existing property founded about 1888. 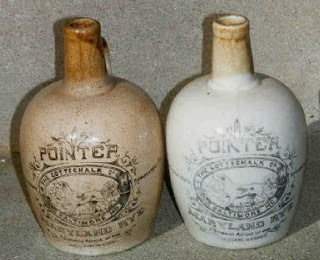 One of its bottles is shown here The company is recorded having operated the brewery until 1920. 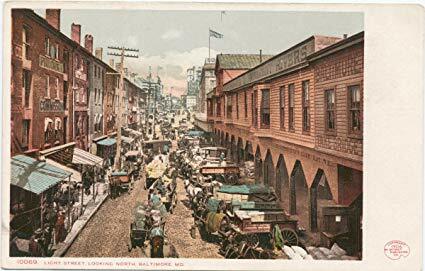 During this same period to his business empire Gottschalk added Fairall & Company on North Charles Street, a store that sold fancy groceries and, of course, imported and domestic wines and liquors. 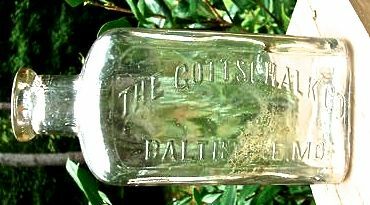 Gottschalk’s most significant business triumph was building his own distillery, one he called “The Maryland Distilling Company” in 1894. Shown here, it was an impressive facility, rising to four stories and encompassing a city block at North, Saratoga and Davis Streets. 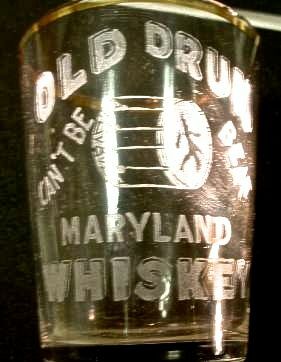 Known as RD #7 Maryland in government documents, the distillery showed steady growth. Its mashing capacity of 900 bushels of grain daily put it second in Maryland in size only to the Melvale Distillery. [See my post of May 8, 2018 on Medvale.] 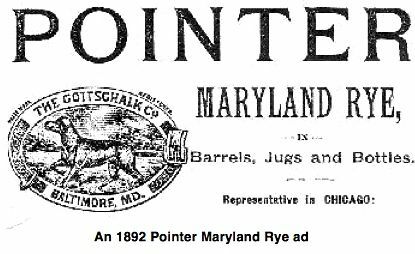 The Maryland State Tax Commissioner reported the taxable value of distilled spirits from Gottschalk’s facility in 1897 at $48,252. By 1905 that number had almost doubled and by 1907 was reckoned at $90,724 — equivalent to $1.8 million today. Unfortunately Albert Gottschalk would enjoy his “conglomerate” only four more years, dying in October 1898. After a Jewish funeral service he was buried at Oheb Shalom Cemetery in Baltimore. His widow, Rosa, would join him there four years later. A large monument, a detail shown here, marks the spot of their interment. 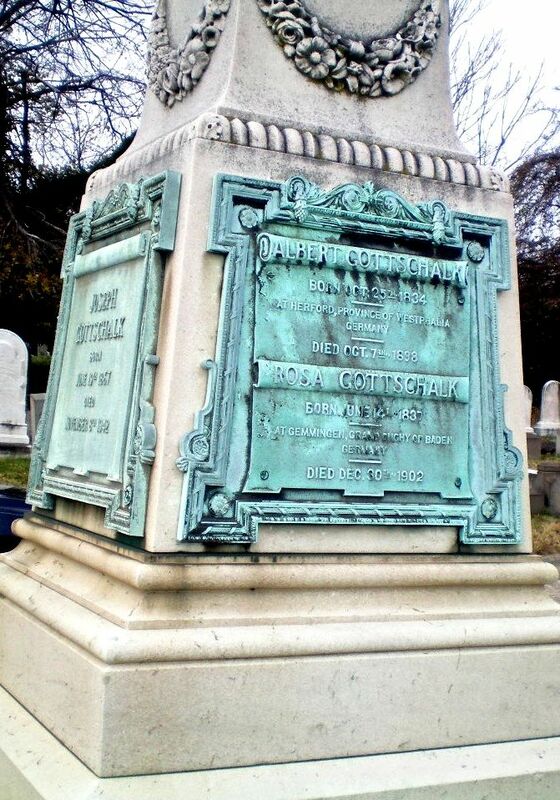 With his father’s death, Joseph became president of the Gottschalk Company. In 1904 Joseph faced a crisis when the Great Baltimore Fire of 1904 resulted in damage to both Gottschalk liquor stores but he soon opened at 1766 North Gay Street and soon rebuilt at the original addresses. Joseph and other family members ran the business in alliance with the Fleischmanns of Cincinnati (yeast and liquor) following a marriage that united the two families. 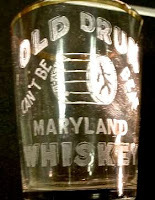 Using many of the merchandising methods that Albert pioneered, the Gottschalk Company and Maryland Distilling continued to expand operations.Two of its national brands, represented here by shot glasses, were Calvert (“The Banner Maryland Rye Whiskey”) and Old Drum Rye (“You Can’t Beat It.”). National Prohibition shut down the Gottschalk empire. 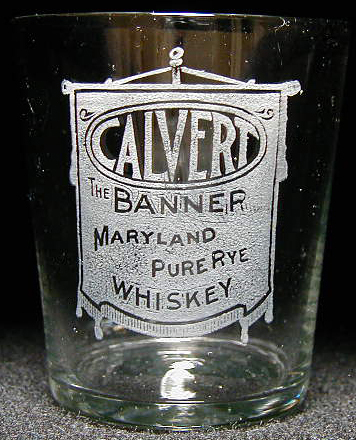 After Repeal a Fleischmann heir who had retained title to the brand revived the Calvert label. “Rags to riches” story of young immigrants to America making good are not unusual. Albert Gottschalk’s rise is unique, however, for his imagination and versatility in the disparate enterprises from which his “conglomerate” grew. 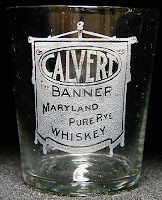 Labels: Albert Gottschalk, Calvert Rye, Fairall Grocery, Fleischmann, Gottschalk & Spilman, Joseph Gottschalk, Maryland Distilling Co., Old Drum Rye, Pointer Rye, Standard Brewing Baltimore., The Gottschalk Co.